From today everyone, truly everyone, can even collect email addresses and phone numbers offline, directly from in-store tablets used at fairs and all kinds of events. Whatever kind of tablet you have, now you can use it to collect contacts offline. That’s right, because today we’re presenting the new version of the Jade app, finally also available for tablets with Android systems. You’ve been asking us for this upgrade for some time, so that you could connect any type of tablet to the MailUp platform. Do you remember how Jade works? Let us refresh your memory. Jade is the MailUp application that lets you collect email and SMS contacts directly from your tablet, even when you’re not connected to the internet. Once connected to MailUp, Jade collects the contacts and then synchronizes them with your lists of recipients on the platform: this is where you’ll find the new email addresses and phone numbers to send your next campaigns to. What is Jade’s fundamental feature? 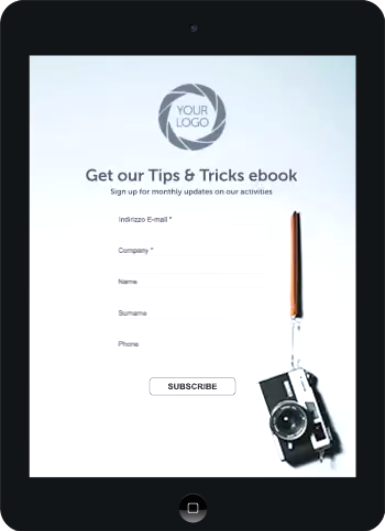 The one that lets you create a multi-channel subscription form with a totally customizable layout. Here are some examples. In short, this is the other side of database building activities (complementary to those online) and features the physical presence of the contact. 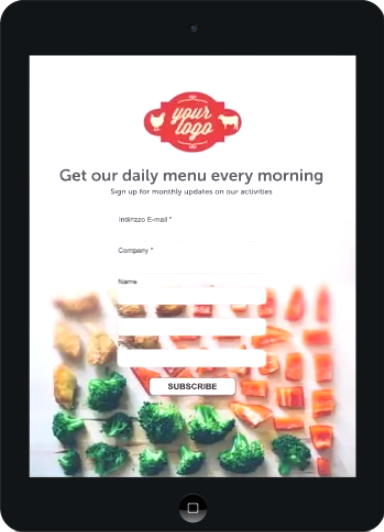 the MailUp platform, which you can request for a free 30-day trial. Confirm that you authorize Jade to connect to your MailUp account. Export the forms and import them to other devices. 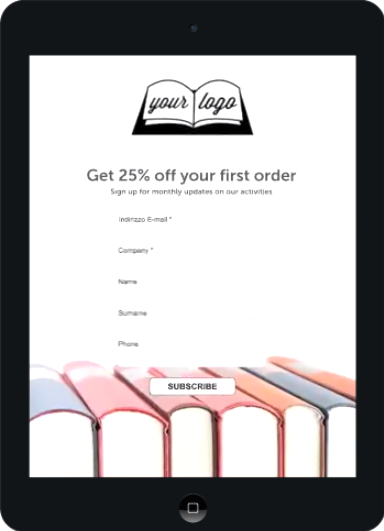 When creating a form, Jade starts with a very simple template, a basic one that functions as a structure: it contains only the name of the list as a title, the notes of the list as a welcome message, and the Email address field. Now that we have the basic form, we can proceed to customize it on several levels: text, graphics, fields. 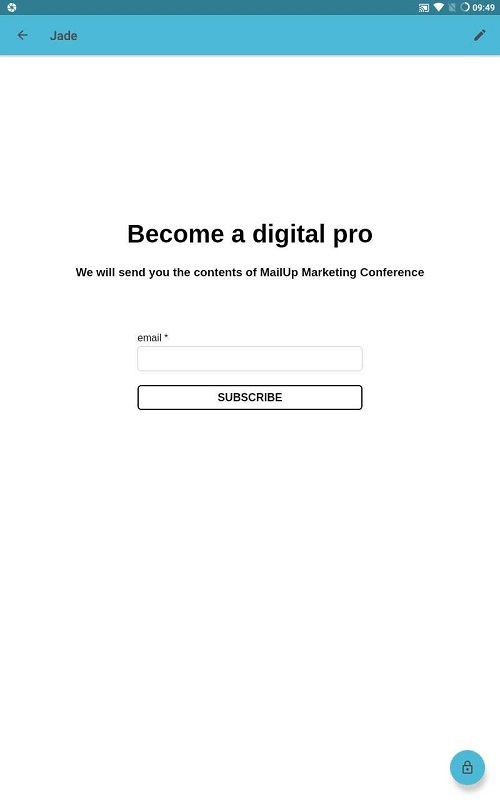 Let’s create one together, dedicated to the MailUp Marketing Conference. The goal is to create a form that best reflects the visual identity of the event, defined above all by its colors and logo. Let’s start. Subscription message: the successful subscription message is shown if you have disabled the confirmation request email from the form options. Subscription message (with confirmation): the subscription message shown if you have enabled the confirmation request email from the form options. Background, which can also be uploaded from your tablet or chosen from eight ready backgrounds that have already been optimized for Jade. 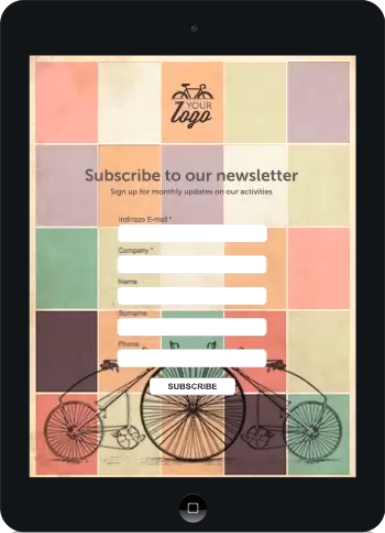 Choose the subscription channels: email address, mobile number, or both. Choose the field format (checkbox or drop-down menu). In order to constantly renew its database, Giochi Preziosi needed a tool capable of converting fairs and events into occasions for collecting new contacts in a fast, intuitive and automated way, without the delays and hitches that paper management inevitably entails. For the G! come Giocare 2015 sector trade fair just before Christmas, Giochi Preziosi entrusted the collection and management of contacts to Jade. Customized with the company’s logo and background, the form that the Giochi Preziosi staff offered visitors included only four fields: name, last name, province, and email address. Just a small amount of information to encourage prospects’ filling out the form, but sufficient enough for the subsequent geographical profiling of the recipients. In addition to the collection activity, Jade automated the entire contact management process: the data was saved directly in the group and in the list that had been pre-set on the Giochi Preziosi MailUp platform, and immediately made available for fine-tuning a new campaign. Once the data was obtained, Giochi Preziosi sent the new contacts a welcome email to confirm their subscription (according to the double opt-in modality) and – once the event was finished – a follow-up email including a small Christmas gift. During the days of G! come Giocare, Giochi Preziosi collected a total of 1978 new contacts thanks to Jade, 66% of whom confirmed their subscription via the welcome email with double opt-in. Result: at just one event, Giochi Preziosi succeeded in increasing its contact database by 5.8%. Moreover, the new group turned out to be particularly reactive to the first emails sent: the statistics revealed that 36.38% of the recipients read and clicked on the post-event emails. Double the amount of the average percentage of the other sending groups. Prepare and include a gift in the follow-up email, but without announcing it during the contact collection: the surprise will make your emails even more appreciated. As you’ll have guessed, Jade is free and easy to install and use. All you need is a MailUp platform; if you don’t have one yet, you can request a free 30-day trial.